It is the fourth largest island in Greece and has a total area of almost 1,402 km². It belongs to the Dodecanese archipelago, of which it is the main island. About 117,000 people live on Rhodes and most of them live in the capital of Rhodes City. The island is 38 km wide and 78 km long. Its highest point is the 1,215-metre-high mountain of Attavyros. With well over 300 hours of sunshine a year, it is one of the sunniest regions in Europe. In July and August temperatures of over 40 degrees celsius are not uncommon. At the coastal regions, however, the prevailing winds always cool down somewhat and do not make the temperatures appear unpleasant. The island's main economic activity is tourism, followed by wine and olive growing. Numerous sheep and goats, which still live here semi-wild, populate the valleys and mountains of the island and not infrequently also the streets. Delicious cheese specialities are prepared from the milk of these animals. The international airport Diagoras on the Greek island of Rhodes carries the three-letter IATA code RHO. Anyone who reads the three letters RHO in a signposted way, or reads the three letters RHO in bids, will be aware that this is the airport of Diagora on the island of Rhodes in Greece. It is served by airlines from all over the world. It is often referred to as "Rhodes Diagoras International Airport (RHO)". Rhodes airport is located on the west coast of the island and the capital city of Rhodes is about 16 kilometres away. The old Rhodes-Maritsa airport was replaced by the new Diagoras Airport in 1977. Nevertheless, the new airport has only one runway with a length of 3,260 meters and a width of 45 meters. However, it also offers large aircraft the possibility of landing. There are only two terminals at Diagoras Airport and around 4.5 million passengers are handled here every year. The scheduled airlines from Greece named Aegean Arlines and Olympic Airlines fly to Diagoras airport in Rhodes throughout the year. In the airport building there is an ATM machine and exchange office, a medical care service, various telephones, a duty-free shop, a café and a restaurant. Unfortunately, there is no panoramic terrace and no WLAN hot-spot. RHO Airport Diagoras is located in the cosmopolitan suburb of Rhodes City, called Paradisi. There are many car rental companies from which you can rent a car directly at Rhodes Airport at very low rates. The onward journey by rental car directly from the airport is not only convenient but also inexpensive. You can also take a taxi or bus to the desired places on the island. It is possible to book a taxi to the airport at the desired time via online reservation. For example, if you would like to travel to Rhodes city by bus, you can take this airport bus from 06:00 a.m. to 10:30 p.m. every half hour. The holiday centres on the east coast of Rhodes are also only an hour's drive away on very well developed island roads. On the East Coast Road 95 from Rhodes city it takes 30 minutes to reach the holiday centre Archangelos, 50 kilometres to Lindos and about 45 minutes by car to the holiday resort Pefkos. The Faliraki tourist centre is about 17 kilometres from the airport. With the rental car all holiday centers are conveniently and quickly accessible, so it is advisable to rent a car from the airport. If you want to rent a car cheaply, Rhodes Airport is the right place for you, as many international rental car companies have settled here. Just to name a few well-known car rental companies: Hertz, Avis, Budget, Europcar, Alamo and Sixt are represented here and also have their pick-up stations directly at the airport RHO. The car hire offers are very varied and particularly cheap due to the variety of car rental stations. It is possible to rent a car for less than 11 Euro per day. The pick-up station can be booked directly at the airport or in another holiday destination of your choice. It is also possible to pick up the rental car at a pick-up station, but to drop it off at a completely different pick-up station. For this you have to pay a surcharge, that the car has to be returned to the actual car rental. In Greece, and thus also on the island of Rhodes, there is right-hand traffic. The roads on Rhodes are not only well signposted but also very well signposted, there are several petrol stations along the roadside. Above all, the large brand of "EKO petrol stations" is represented by a widespread network of petrol stations, including directly at Rhodes airport. As a rule, they take over the rental car with full tanks and can refuel it at the airport at the end of the trip. The major petrol station operators accept cash, EC and credit cards. The petrol station attendant usually fills Rhodes himself, so he knows exactly what kind of fuel to fill. He will certainly be very happy about rounding up the refuelled amount as a small tip for the petrol pump attendant. In the sparsely populated south of the island, the density of petrol stations is not quite so high anymore and the road conditions are also somewhat worse. But even there you don't necessarily need an SUV or jeep to drive everywhere. With a fully refuelled car you can get around the island about twice, so it's no problem if you don't see the next gas station in sight. And the fuel is quite cheap in Greece anyway. Rent a cheap rental car and explore the beautiful island in the Southern Aegean Sea. The historic old town of Rhodes is like a huge open-air museum. It is considered one of the best-preserved medieval cities in Europe and is also recognised as a UNESCO World Heritage Site. The Grand Master's Palace, the fortifications, the city walls and paved streets such as Ritterstraße are worth seeing. There are numerous Turkish mosques to visit. Most of the hotels are located in the modern and architecturally completely different designed new city. A great contrast for the eye to explore. The Old and New Town are only a 10 to 15 minute walk away from each other. The pulsating nightlife also takes place in the new town and you can visit the marina, the cruise ship terminal as well as the popular and typical Greek Mandraki harbour. If you want to visit the most picturesque place in Greece, you should visit Lindos. 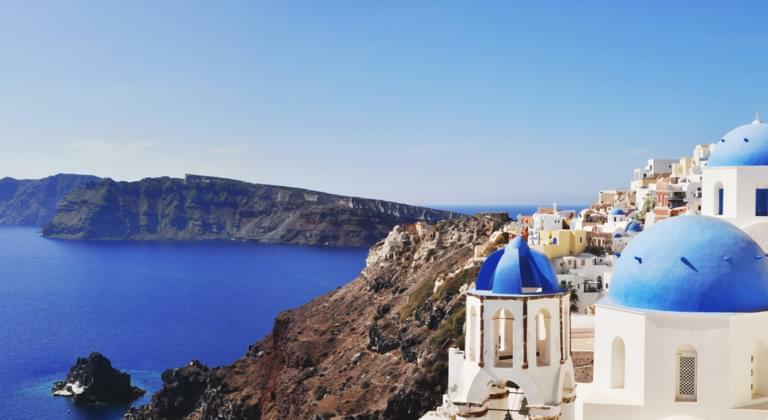 This place with its white houses nestles against a mountain slope and as a crowning glory the second largest acropolis of Greece is enthroned on the hilltop. You can either walk to this temple complex from antiquity or take a donkey taxi. From the top you can enjoy fantastic views. A "must-have" in Lindos is also the famous valley of butterflies, where it flutters colourful, wild and rarely from these delicate creatures! This is the most popular holiday resort in Rhodes, which also has the longest beach with a length of five kilometres. It is located on the east coast and with its perfect infrastructure, it promises the finest bathing and beach pleasure as well as a luscious nightlife. This golden yellow, fine sandy beach is located on the east coast and south of the village of Kolymbia. Next to Faliraki Beach, it is considered the most beautiful island beach. Beach bars are available, sunbeds and umbrellas can be borrowed. These are not only Eldorados for surfers but also popular holiday resorts on the northwest coast of Rhodes, just a few kilometres from the capital. If you would like to visit the beautiful Aegean island of Rhodes in Greece, you should rent a rental car, preferably directly from the pick-up point at the airport, where you can return it comfortably at the end of your holiday. This makes you independent and allows you to explore even the most remote and secret places of the island's paradise.